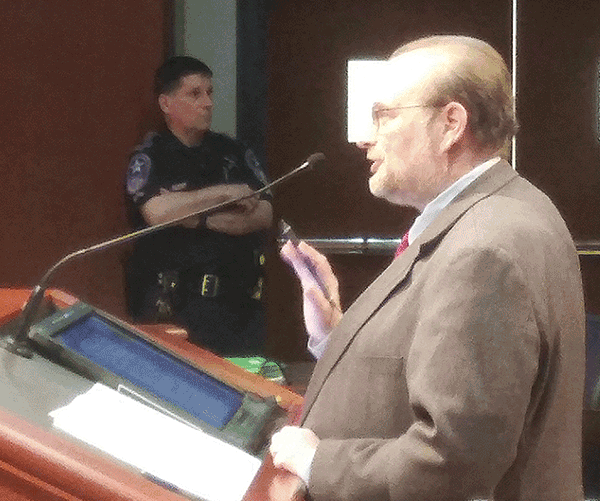 Deputy county attorney Rob Robinson speaks about the case before the Chesterfield Board of Zoning Appeals last week. The owners of a small piece of land that houses a Confederate battle flag next to Interstate 95 lost a battle last week. Church Road resident Catherine H. Hendricks purchased the land at 2501 Old Bermuda Hundred Road from James and Barbara Eaton last year. 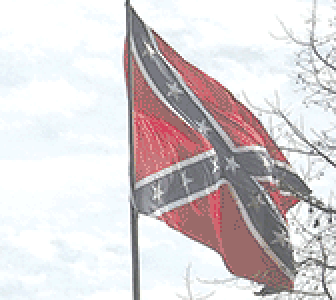 Hendricks and the Virginia Flaggers were issued a notice of zoning violation Oct. 31. The Chesterfield Board of Zoning Appeals unanimously affirmed the violation notice at the end of a Feb. 6 hearing. Deputy county attorney Rob Robinson spoke on behalf of the Chesterfield Planning Department. He said the case involved several legal issues. The 68-foot-tall flagpole exceeds the 50-foot height limit, is 27 feet too close to the right-of-way along Old Bermuda Hundred Road, and is not being used for farming, he said, noting the latter would establish the right to have a flagpole as an accessory use. “We take no pleasure in taking people to court,” Robinson said. “The content of the flag is absolutely immaterial to us.” He noted that county Planning Director Andrew Gillies sent a zoning determination letter about the flagpole to Sandston resident Grayson Jennings of the Virginia Flaggers on Feb. 13, 2018. David Konick, a Rappahannock County attorney representing the Flaggers, said Chesterfield’s zoning ordinance was being applied in an unfair manner. Konick said the zoning violation notice was improper because it was signed by Ted Barclay, a county planning administrator, when the ordinance gives that authority only to the planning director, Andrew Gillies. Konick disagreed with the county’s determination that the Flaggers needed to use the 0.8-acre parcel as a farm. “The argument that my clients have to go out and plant some tomatoes so they can have a flagpole doesn’t make any sense,” he said. He later noted that the land used to be part of a larger agricultural parcel located on the east side of I-95. Jennings said the Eatons had originally planted millet on the property. “The Planning Department doesn’t like the flag, so they’re going after anything they can,” Konick said, noting that he sits on the Rappahannock County Board of Zoning Appeals and previously was that county’s zoning administrator. Robinson said the flagpole is a structure under the county zoning ordinance, but Konick disagreed and cited a 1913 state Supreme Court ruling that defined what a building is. “Under state Supreme Court definitions, a flagpole doesn’t meet the definition of a building or a structure, so it shouldn’t be regulated by the zoning ordinance,” Konick said. A 50-foot flagpole was initially installed on the property in 2013 after a building permit was approved and remained there until 2016, Robinson said. The 68-foot flagpole was raised in 2017 without a building permit, and a complaint was filed. Jennings then submitted a building permit application on Feb. 16, 2017. Vesting rights, if any, would apply only to the original flag, Robinson said, but added that vesting rights do not apply to building permits. During public comment, Dinwiddie resident Susan Lee said the Chester flag was the first of 27 the Flaggers put up in the state. “If you’d have left the flagpole at 50 feet, you’d be OK,” board member Graham Daniels said. “Apparently you kind of lucked out in 2013.” That was in reference to the original permit being approved by a building official and not the planning director as required. Chester resident Barry Isenhour said community and outside pressures have affected the situation. Daniels – who represents the Bermuda District where the flagpole is located – said the board doesn’t consider the content of the complaint. “They may have complained about the content … we can’t really get into that,” he said. Board chairman John E. Caperton suggested the Flaggers apply for a variance to raise the allowable height of the flag to 68 feet. Board member Thomas E. Bennett suggested the Flaggers reapply and put the pole farther away from the road. “I’d think it’d be looked at favorably,” he said. Konick said he would confer with the Flaggers board regarding an appeal to circuit court. During the meeting he noted that a 212-foot-tall U.S. flag is located 2.3 miles north of the Confederate flag at Coxendale Road, I-95 and Route 288. Robinson said the Chesterfield Board of Supervisors approved a conditional use permit for that flagpole. Chesterfield Planning Director Andrew Gillies declined to answer questions and comment on this case.